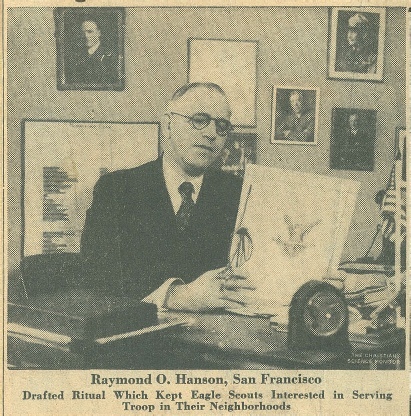 On Sunday evening April 19, 1925 a group of ten Eagle Scouts from the San Francisco Council gathered at 704 Market Street in San Francisco in the office of Scout Exec Raymond O Hanson. The purpose of the meeting was to create an organization which would hold the interest of older scouts and could serve as an additional incentive for others to attain the rank of Eagle. 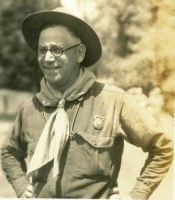 Hanson had been thinking for some time about the problem of how to keep older scouts interested in Scouting. There had been too much of a tendency for those approaching “manhood” to drift away and lose all interest with the movement. At the same time growth of such organizations as the De Molays was phenomenal. Hanson thought he knew the answer. The older boys like rituals, so he worked out a ritual for the Scouts and named the order Dunamis and to make the organization thoroughly glamorous he decided to only invite Eagle Scouts to join. The idea was so enthusiastically received by the group during this meeting that it was decided that night to organize an “Eagle honor society” devoted to service. The name of the new association would be called the Knights of Dunamis. When the KOD was first organized, the leadership of the association was led by the Chapter Commander, the Senior Councilor, the Junior Councilor, the senior guide, the junior guide and the inner and outer guards. The name of the organization was carefully selected to reflect its dedication to service as the word “Dunamis” is derived from the Greek word meaning “power” or “Spirit”. As “Knights,” the members would uphold the tradition of chivalrous service begun in medieval times. The motto of the Knights of Dunamis was “Power and Service”. The insignia of the Knights of Dunamis would consist of an Eagle, a sword and a Shield of Dunamis. The image of the Eagle symbolizes service, the sword symbolizes leadership gained in serving and the triangular Dunamis shield signified the three parts of the scout oath. The official neckerchief for the general membership was white with a KD emblem sewn on the back. A royal blue neckerchief with the emblem on the back was worn by national officers starting in 1949. Councils that participated in the Knights of Dunamis met in their own local chapters. The San Francisco Council (also known as the founding chapter and grand chapter) was Chapter 1 of the Knights of Dunamis. By the fall of 1929, 12 chapters had been established in five states: California, New Jersey, Oregon, Missouri, and Pennsylvania and by May of 1935 there were 34 chapters scattered throughout the country. The Oakland Area Council would also have a KD chapter which was formed on June 14, 1936 and was known as the Oakland Chapter (Chapter 40). In 1929 the first KD national conference was held at the Bellevue Hotel in San Francisco. Delegates from six chapters met to organize a national board and vote on national officers including a Grand Commander. The Grand Commander would act as the national leader of the entire KD organization. Nineteen year old Eagle Scout Ken Moynihan of Troop 122 from the San Francisco Council would be the first person elected as the Grand Commander of the Knights of Dunamis. At least two additional members of the San Francisco Council would also serve as Grand Commanders. In 1938, charter member Lou Mulloy was elected Grand Commander and in 1949 Joe Ehrman (Distinguished Eagle Scout recipient) from San Francisco Troop 14 would be elected to serve as the Grand Commander. Starting in 1933 the Knights of Dunamis was formerly recognized by the National Executive Board of the Boy Scouts of America and in 1935 the organization was officially designated as part of the senior scouting program. On the 10th anniversary of the Knights, Chief Scout of the World, Robert Baden-Powell was conferred with an honorary life membership in the Knights of Dunamis. In 1944 the entire Knights of Dunamis membership was saddened by the news that their founder, Raymond Hanson, had died. Members of San Francisco’s Chapter 1 erected a memorial at Camp Royaneh in his honor at the Knights of Dunamis grove which overlooks the East Austin Creek valley. By 1971, only about 37 KD chapters were still active across the country and later that year the National Council of the Boy Scouts of America formerly accepted national administration of the Knights of Dunamis youth program . One year later, the Knights of Dunamis organization merged and became the nucleus of a new national program called the National Eagle Scout Association (NESA). Although there were other Eagle Scout Associations (including the “O-hit-e-kah Tribe” of the Oakland Area Council in the early 1920’s) the Knights of Dunamis was the most prominent association for Eagle Scouts before the formation of the National Eagle Scout Association. On April 26th, 2011 the San Francisco Bay Area Council officially organized its own NESA chapter. The meeting and chapter was organized by Eagle scout, DESA member and SFBAC President Rick Pickering. Eighty-six years after our founding Council created the first Eagle Scout Association, and forty years after NESA was created, the Eagle Scouts of the Bay Area once again would have a local chapter dedicated to holding the interest of Eagle scouts. From the San Francisco Chapter #1, K.D.! 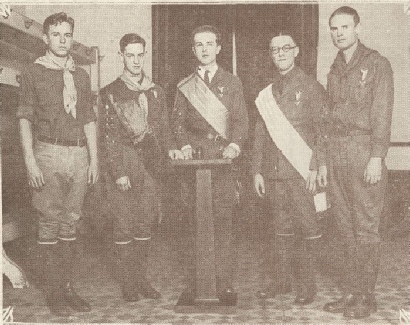 Note: These first officers of Chapter 1 are possibly some of the original ten Eagle Scouts that gathered in Raymond O Hanson’s office on April 19, 1925 to form the organization.